Spread hummus evenly over wraps. 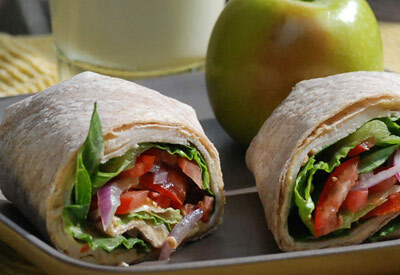 Top each wrap with turkey, lettuce, tomatoes and onion leaving a 2 inch area around the outer edge of the wrap for rolling. Roll up burrito style*. Cut each sandwich wrap in half and wrap each piece in plastic wrap. Chill for 4 hours. Fold two sides towards center. Fold bottom towards center and roll snuggly, keeping sides tucked. Place seam side down.